Once Upon a Time | “A children's story that can only be enjoyed by children is not a good children's story in the slightest." Born with a gift that he tries to hide, Amos struggles through life with the knowledge of his water-seeking ability. His Pa was a “dowser” as well, but he thought it was a curse, tying him to his work instead of the mountains where his true calling lay as a trapper. So Amos stuffs his skill way down, trying to forget so he can be like other boys. Except, how can he? The water both calls to and terrifies him. How can you live a life that you yourself have torn in two? This book had a crazy amount of potential. Seriously. But living up to the expectation of the description is easier said than done. The one thing I could tell about this book: the author was in love with it. She was in love with her characters so much, she couldn’t drop any ideas that came into her head. What I mean to say is this: there was too much that happened in that story. The overall plot could have been summed into maybe half as long as the book actually was. In essence, she didn’t want it to end, and she couldn’t let anything go. If I was the editor, I would have ripped out whole chunks and then flung it back at her. Typically, the reason a book is long is because one of two things needs to happen: a. lots of plot! Or b., serious character development. In this book, I felt like it was neither; it was just filled with lots of….stuff. You could say it was plot, but instead it was just hopping from one random Western-type story to the next. His childhood takes forever to come to an end by the time they hit the Oregon trail. At that point, he should have developed lots and lots of character, but instead he is a sort of vague and generic boy. I think the idea of a character needs to be explored by the author. It felt like she thought that character meant all this stuff that was on the outside of the character, instead of digging to the heart of the issue. Amos could have struggled with extreme loneliness, depression, abandonment, trust issues and fear of a whole slough of things. Instead the author decided to give him talents and outward random oddities like birds following him and natural artistic ability. Those things do not set Amos up for a triumphant ending by wrapping up his internal struggle full circle. It sets up the ending to be evident and clear from the beginning, thus being less climactic and meaningful. I would have preferred to see this book structured out a little more thoughtfully, and given a major edit before publishing. A side note: kudos to Will Patton the narrator! Switching from a Southern accent to British with ease is no small feat. We really enjoyed his voices and creative voices. UPDATE: This post was mostly finished before I finished the book, but the ending was so badly wrapped up and killed any tension that might have been building by pulling a “Ten Years Later”….. This was going to get a 3/5, but now it is 2/5. It was so bad we were all laughing as the narrator goes into the credits. Audience: ??? The beginning was awfully rough for a children’s book. Maybe 12 and up? We are a sensational team. And I have told the truth. I am over the moon excited to finally have something good to say about a book; there have been a couple real doozies that I have not been happy about, as I’m sure you’ve noticed. My first intro to this book was on a road trip about 3 years ago. We checked out a couple audio’s, but we only got a few chapters into the book before turning it off; too much swearing. I don’t think we realized it was in the teen section. Since then, I have been in dire need of a new book that was good and checked out this one after seeing that it had won a couple of awards since then. I have also read raving reviews of the audio; apparently the narrator has really good accents. Quite a few characters have different accents, including French, German, American, Scottish, British and Jamaican. Personally though, I prefer to read swearing than hearing it out loud. Too jarring. All in all though, I didn’t think there was too much to handle. Oh, so many good things! A historically accurate novel that is interesting is a really rare gem; most novels with lots of random facts thrown in tend be on the boring side. Wein does not mention anything that does not pertain to the story just because, which was a relief. This story was all about women pilots during WWII, and I found out at the very end that Wein is actually a pilot. No wonder she knew so much! She really knew what she was talking about! I will say that it took a while for the story to warm up a little, but the mystery of why Verity was so willing to talk during interrogation kept me curious the whole way through. Oh, and the end! So dang good! Warning: it will probably make you cry. There was one part that I was particularly impressed by that didn’t need to be included. It doesn’t really give anything away, but Maddie is staying with a French family who are part of the resistance in German-occupied France. She is sleeping in the room of the oldest brother, who now works for the German Gestapo and is a ruthless inquisitor. Being a little nosey and curious to know more about the rebel, she finds an old notebook that he kept when he was only 10 years old, in which he writes that he has decided to be a nature enthusiast and is studying birds. I had tears in my eyes as Maddie wonders what it is in a man that turns him from a bird-watcher to cruel investigator. There was something really incredible about the way Wein turned all the “bad guys” into something less bad. A little more blurry. von Linden, who can’t bear to see Verity’s pain. The bird-watcher-turned torturer. A little compassion here, an interest in her backstory there. Startling, but it made the story incredibly real, while also not exactly dwelling on what wasn’t needed. As you might have figured out by now, this is not a children’s book. If it was a movie it would be a firm PG-13 for all three categories that I rate for. It is almost just as much an adult novel as a teen novel to me, but it could easily have been turned into an R rating if the author wasn’t so dedicated to her original age range. I will definitely be on the look out for another book by this author! In a house on the coast of England, there is a door. It hides unimaginable mysteries, unavoidable danger, and unbelievable surprises. When eleven-year-old twins Jason and Julia move into the old mansion with their family, the door is a secret – locked and hidden behind an old wardrobe. This book was originally written in Italian, then was translated to an audio. I’m not sure whether you can find it in book form or not in English. On a roadtrip to Seattle, Washington we checked out three audios. Two, come to find out, were about halfway through a series we had never heard of. So we were stuck with this one the whole way there and back. I was not thrilled. It was like a cross between Indiana Jones and National Treasure, but the peril was lurking at quite a distance. There were supposed to be a lot of tense moments, but there wasn’t enough tension in the situation because multiple times nothing happened. Multiple close calls don’t make for a very interesting story, because then you figure out that the author has no intention of anything happening. Not very life-threatening if you know there life isn’t threatened. They also happened to be child-geniuses. 11 and 12 year olds aren’t supposed to know about ancient extinct languages, have the strength to row a huge ship that has run aground and make wise life decisions in a dark tunnel with parents conveniently out of the way. You may get tired of hearing , “Hey guys!” I suppose the title should have given me a hint about what would happen in the end, but I must admit I found the end a little annoying. If you really liked 39 Clues but without the gruesome bits, or the Magic Tree House series, then this might be the book for you! Hi readers! Sorry to leave you in the lurch during the holidays, but I’m back! 2015 has been an amazing year, filled with lots of good stories. So, to start the new year, here are some of the best books I reviewed in 2015. 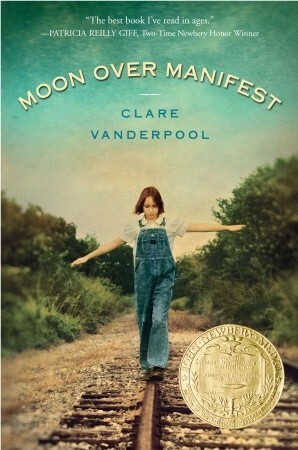 When Abilene Tucker shows up on a train in Manifest, Kansas by herself, the sign reads, “Manifest: A Town With a Past”. Strange; that isn’t what her daddy Gideon told her it said. In fact, there are a lot of things Gideon told her that don’t match up about Manifest, the town where he grew up. Looking for more clues about Gideon around Manifest, Abilene is surprised to find that there is more to this town than meets the eye. Tales of the mysterious ‘Rattler’ begin to pop up after Abilene finds a box of knick-knacks under the floorboards of a church. With her two new friends, Abilene begins a hunt to find out what happened to the Rattler, and Gideon, twenty years ago. Walking down the Path to Perdition, Abilene must face the reality the maybe Gideon isn’t coming back for her. My first inclination with this book was yes, it was very good. Well written, with interesting background and secret pasts and mysterious dodgy citizens. A well thought out plot, and lots of research. Basically, everything that a person with refined taste in style raves over, like a librarian or an English teacher that will assign it as reading, because it contains everything they’re looking for: history, character building and ethnic diversity. While I don’t consider my own tastes “refined” in any way, I am trying to look at this book from several different angles: the critical, factual perfectionist editor angle, and the potential forced to read this in Junior High angle (which I was not, but the Newberry status of the book makes it the perfect candidate). From the critical standpoint, I have absolutely nothing to say that was bad on a technicality. The writing style was unique, the story well-told, and an overall good feeling of coming together-ness from a town that fell apart 20 years earlier during WWI. Personally, I liked this book. I wasn’t on the edge of my seat, but I thought it was deep enough to enjoy, especially for a children’s book. It’s sort like the next step up from the American Girl series, but better and less girly. If you really enjoyed those books, then this is your cup of tea. In 1766 a tale, told in pictures, reveals the story of the Marvels. Beginning with Billy Marvel, survivor of a shipwreck at sea, the saga of theater-bound generations are not spoken, but shown descendant after descendant. Fast forward to 1990. Joseph Jervis has runaway from school to find his Uncle Albert, an unknown relative who might just hold the key to the adventure Joseph is looking for. Upon arrival, Joseph finds that it isn’t his uncle, but the house he lives in, that brings more mystery about his family’s past than he even knew existed. When I said that the first story was told in pictures, I meant it. Brian Selznick himself sketched over 300 pages of pictures, so don’t be intimidated by this book’s size. The total amount of time it took to read this book isn’t very long, even if you take your time soaking in the pictures. Also, don’t get to thinking that this is a picture book; the plot is too big for that. It was such a beautiful story. This is one of the books where you get so invested in characters that it’s hard to let the book end, especially the illustrations. I was really struck with the emotions which aren’t really said in the book, but once you take a minute to see what’s going on on the inside, almost a secret second plot, things like grief, overwhelming loss, and seeing things in a deeper sense even if it’s only inside your head become apparent. One of the more interesting things about this story is that, all in all, there was a lot of plot for the amount of story that happened, but that wasn’t actually a lot. If you could pack the entire book into a summary, you could, but that awesome sense of unfolding doesn’t happen. Like I said, the actual read time isn’t long but in the end it turns out to be so simple that it makes you wonder at how well it is written. 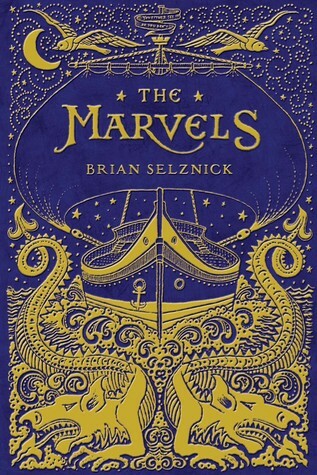 Another fantastic book by Brian Selznick, who also wrote The Invention of Hugo Cabret, which still is one of my favorite books of all time. The review is here. I look forward to reading Wonderstruck. Audience: Ages 10 and up; the general themes are too grim for anyone younger. Personal taste can vary hugely as to what age can read this. Hugo has kept the secret of his notebook from everyone he knows, even if he doesn’t know many people at all. But especially from his uncle, his only living relative. Arguably, Hugo’s very existence of living among the clocks in the walls of the train station in Paris is a secret, keeping them well-oiled and running. When Hugo’s Uncle Claude leaves and doesn’t come back to the train station, Hugo begins to wonder what will happen if the clocks stop working. He knows how to fix them, for the most part, but what will happen if the station inspector finds out he’s living alone? It would be straight to the orphanage, and then the secret of the notebook and what Hugo hides would be lost forever. Have you seen this movie yet? If you’ve only just heard about it, please, please, please read the book first! The movie adaptation, named Hugo, is a relatively good movie, but it is just so much more awesome once you know the story. There is a lot left out, and the story is just told in a different way that keeps the mystery much better. There are so many good things to say about this book! 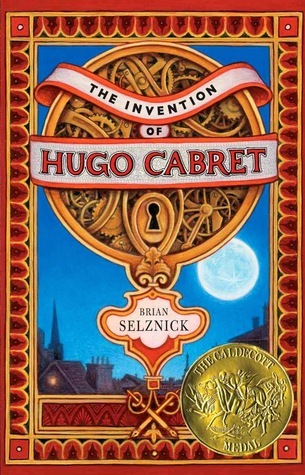 I’ve only read the book through the audio, narrated by Jeff Woodman (who is a personal family favorite), and to this day The Invention of Hugo Cabret is my dad’s favorite book and probably goes down in our history of books as ‘One of the bests’. I am looking forward to checking out the book, because it has only just now come to my attention that the book has beautiful illustrations as well. Double whammy! Technically, this is historical fiction because it takes place sometime in the 1930’s, and there was some history involved which I would rather not say, but the story didn’t feel as involved with the rest of history as you would think. In other words, it doesn’t feel like your typical historical fiction. The way the story unfolds is just fantastic, and even though I hesitate to say it is an action/adventure type story, it still had us on the edge of our seat as the mystery of who Hugo was is discovered. The way the tension builds into an inescapable fiasco is so perfect I don’t know what to say. Other than READ IT. The Willoughby’s are an old-fashioned kind of family. The four Willoughby children do things old-fashioned children do; they go to school, they live in an old house, and they read books about other old-fashioned children in which most of them have no-nonsense nannies, find babies in baskets, have rich parents in a mansion, or no parents at all. 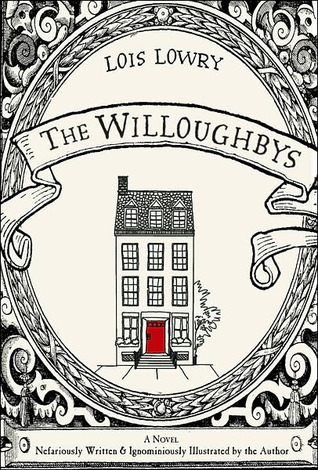 The Willoughby children decide that, yes, they should be orphans and make their way in the world like so many other old-fashioned children have in books. No, they do not like their parents very much. While scheming to somehow get rid of their parents, little do they know that their parents have a plot to get rid of their children at the same time. The whole book was tongue-in-cheek, and more hilarious than I can even say! Many people compare the style of the story to Lemony Snickett, but I thought The Willoughby’s was far funnier. Would it actually bother you that the parents don’t like their own children? Or that they attempt to get rid of them? It shouldn’t; this book was much too hilarious to read into the actuality of orphan-hood. The narrator was very good; not so much the voices he gives the characters, which are relatively limited, but he has a way of stating the funniest sentences in a matter-of-fact way, the very way the children do when they are trying to be serious and don’t think themselves very funny at all. Last note: there is a lot of humor that would fly way over young children’s heads, and arguably, the entire concept of the book. Would a 6 year old find the idea of parents wanting to get rid of their children, or children praying death omens over their parents head funny? It could be taken way too seriously by some. Kids who like old-fashioned kinds of stories will appreciate it.